Dotted vessels – cite! Dotted vessels (message) Dotted vessels – participate! Dotted VesselsThis glossary term has not yet been described. Dotted vesselstiny pinpoint vessels appear as small red dots with a diameter of 0.01–0.02 mm, and they represent vesselsThis glossary term has not yet been described. aligned perpendicular to the skin surface . 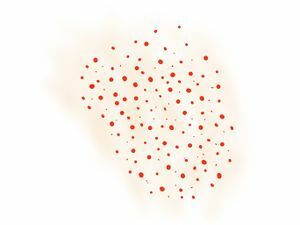 Dotted vessels can be seen in inflamed skinThis glossary term has not yet been described., traumatized skin, or in skin overlying stasis. However, they can also be seen in cutaneous tumors. The presence of dotted vesselstiny pinpoint vessels often implies that a lesion is melanocyticThis glossary term has not yet been described. ; in one study, 90% of the lesions with dotted vessels were melanocytic . In melanocytic tumors, dotted vessels confer a PPV of 38% for melanomaThis glossary term has not yet been described., 16% for dermal/congenital neviis a type of melanocytic nevus (or mole) found in infants at birth. This type of birthmark occurs in an estimated 1% of infants worldwide; it is located in the area of the head and neck 15% of the time., 21% for Clark neviThis glossary term has not yet been described., and 16% for Spitz neviThis glossary term has not yet been described.. In benignis any condition that is harmless in the long run nevi, dotted vessels correspond to vessels at the tips of the dermal papillae and dermoscopically often appear to be situated within the holes of the pigment networkGrid-like pattern consisting of interconnecting pigmented lines surrounding hypopigmented holes.. 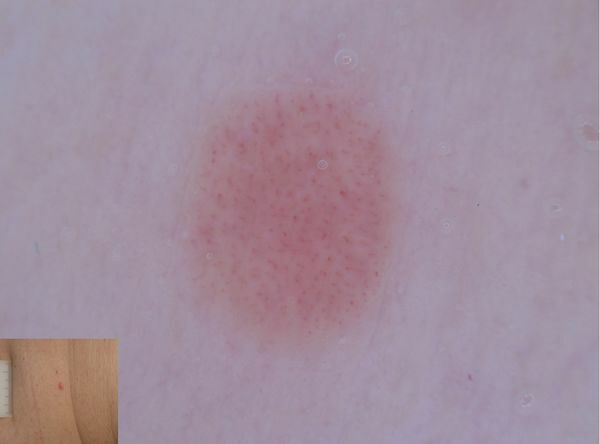 In melanoma, dotted vessels, which are frequently found in conjunction with other vessel types, can be seen anywhere within the lesion but tend to be present at a higher concentration toward the center of the lesion . In a study of amelanotic and hypomelanotic melanomas (AHMamelanotic/hypomelanotic melanoma), dotted vessels were more commonly seen in melanomas <1mm in thickness (27.6%) when compared with those >1 mm in thickness (20.0%); when evaluating purely amelanotic melanomas, dotted vessels were seen in 60% of cases . In another study, Bono and colleagues reported the presence of dotted vessels in 100% of thin amelanotic melanomas (<1mm) (n = 9) . The aforementioned data suggests that dotted vessels may be one of the first morphologic types of neoangiogenic vessels visible in melanoma because they appear to be more prevalent in thinner tumors. In a study analyzing amelanotic/hypomelanotic benign melanocytic lesions (AHBML) and amelanotic/hypomelanotic nonmelanocyticThis glossary term has not yet been described. lesions (AHNML) (tumors), dotted vessels were observed in 32.7% and 21.8% of lesions, respectively. 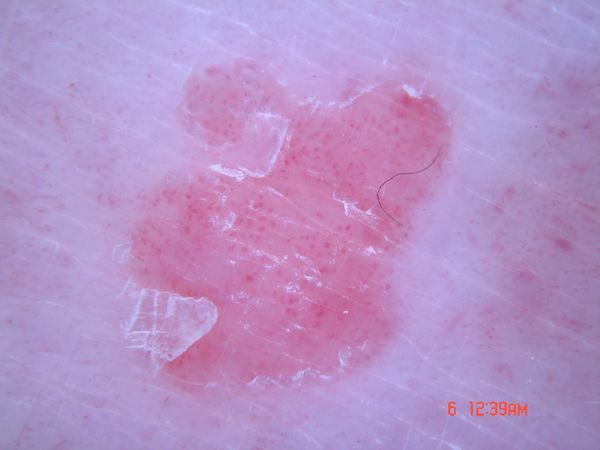 In nonmelanocytic lesions, dotted vessels are commonly seen in psoriasisThis glossary term has not yet been described., clear cell acanthomas (CCA), and squamous cell carcinomaThis glossary term has not yet been described. (SCCSquamous cell carcinoma). The distribution and arrangementThis glossary term has not yet been described. of dotted vessels within the aforementioned lesions can be very helpful in diagnosis. Dotted vessels in psoriasis are relatively uniform in size and are distributed homogenously throughout the plaque . When dotted vessels are arranged in a “string of pearlsCoiled or dotted vessels arranged in lines clear cell acanthoma” or serpiginous distribution, then the diagnosis of CCA is almost certain. Dotted vessels present focally at the periphery or throughout the entire lesion and in association with adherent scale is suggestive of SCC . ↑ Kreusch &: Vascular patternsThis glossary term has not yet been described. in skin tumors. Clin. Dermatol. 2002;20:248-54. PMID: 12074860. ↑ 4.04.1 Zell et al. : Early diagnosis of multiple primary amelanotic/hypomelanotic melanomaThis glossary term has not yet been described. using dermoscopy. Dermatol Surg 2008;34:1254-7. PMID: 18554289. DOI. ↑ 5.05.1 Pizzichetta et al. : Amelanotic/hypomelanotic melanoma: clinical and dermoscopic features. Br. J. Dermatol. 2004;150:1117-24. PMID: 15214897. DOI. ↑ Bono et al. : Clinical and dermatoscopic diagnosis of early amelanotic melanomatype of skin cancer in which the cells do not make melanin. MelanomaThis glossary term has not yet been described. Res. 2001;11:491-4. PMID: 11595886. This page was last modified on 15 January 2019, at 23:25.